Promoting the safe handling of dangerous and corrosive spent vehicle and household batteries. 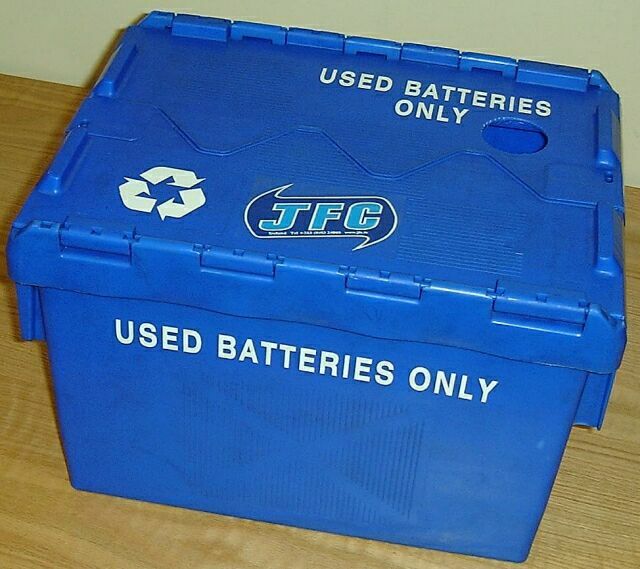 JFC Battery banks or Battery Collection Units are ideal for civic amenity sites. Designed to fit standard pallet tubs the automotive battery bank is instantly recognisable for what it does and offers safe, easy battery collections. Can be sited outside with no protective or civil building work required and is easily positioned by forklift. Base and tops are available seperately. The roof of the bank is designed to keep rain out. Completely corrosion-resistant construction from batter acid- proof linear polyethylene. The lid is 50/50 split hinged, not detachable. Security tabs – uses twist/ snaps rivets.